There are only 4 people in the cast but it is one powerhouse multi-awarded cast with Lea Salonga, Menchu Lauchengco-Yulo, Art Acuña and Adrian Pang. This is the first time all four of them are together on stage. This also serves as the “reunion” project of Lea and Adrian who starred in “Their Playing Our Song” in 1999. 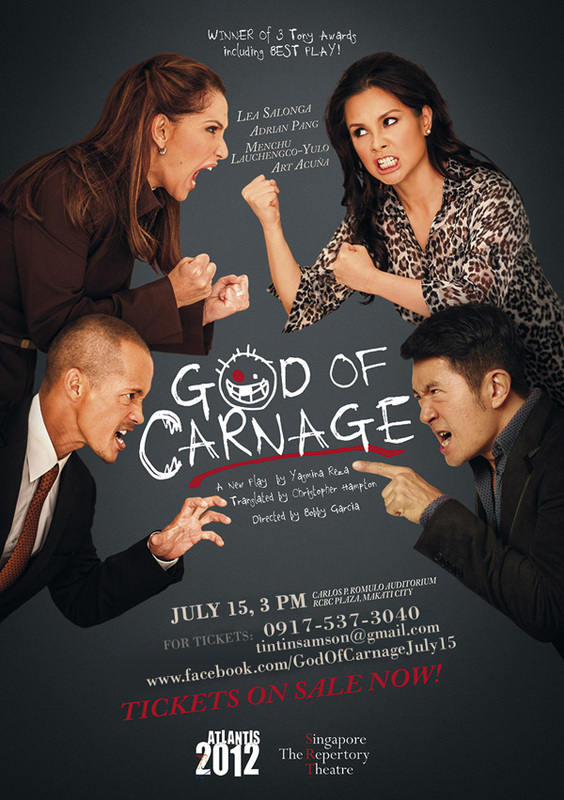 God of Carnage is an Olivier and Tony award winning play about “two pairs of parents, one of whose child has hurt the other at a public park, who meet to discuss the matter in a civilized manner. However, as the evening goes on, the parents become increasingly childish, resulting in the evening devolving into chaos.“ (source). My friend Tin is selling tickets for the July 15, 3 PM show. For interested buyers, you may get in touch with her at 0917-537-3040 or email tintinsamson@gmail.com. Hope you guys can catch the show! * All photos from the July 15 Facebook Page.